Attorney General Mohamed Anil today dampened talk of an imminent pardon for former president Mohamed Nasheed and the commutation of ex defense minister Mohamed Nazim’s jail sentence to house arrest, saying he is yet to receive any information on the matter. “Such matters will be dealt with through established procedures in the criminal justice system… It will not happen without my knowledge. I have not received any information yet,” he told the press. Newly appointed vice president Ahmed Adeeb meanwhile dodged answering repeated questions on Nasheed’s pardon at a press conference held on the ratification of a second constitutional amendment that will allow foreigners to own land in the Maldives. “Our administration will bring about economic reforms and will show generosity and compassion to the public. And God willing, in the instance we have to issue pardons, we will do so,” he said. At a separate press conference, foreign minister Dunya Maumoon dismissed rumors that Nasheed had been invited to the official function to celebrate 50 years of independence on July 26. “Former president Nasheed is currently serving a sentence after being found guilty in court of law so I don’t think an invitation will be sent to attend a ceremony,” she said. 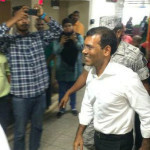 Nasheed was transferred to house arrest in late June. His trial was widely criticised by foreign governments and international bodies including the UN over lack of due process. UK Prime Minister David Cameron, the European Union parliament and influential U.S. Senators have called for his immediate release. 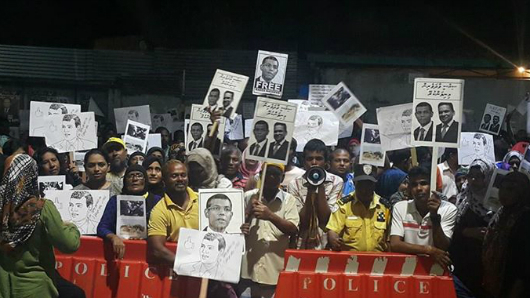 The government and the main opposition Maldivian Democratic Party (MDP) are engaged in negotiations over Nasheed’s freedom, clemency for jailed politicians and withdrawal of charges against some 1400 opposition supporters including the president of Adhaalath Party Sheikh Imran Abdulla. 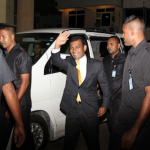 Ibrahim Mohamed Solih, the MDP’s parliamentary group leader, suggested last week that Nasheed may be released by July 26. His remarks came following a third meeting of talks between the MDP and the government. However, at the same press conference, home minister Umar Naseer said the government had made no commitments to release jailed politicians, but reiterated that the government stands ready to make compromises for long-term stability. 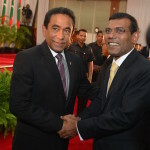 The opposition has backed several government proposals this week in the hope of freedom for Nasheed. These include a first amendment to the constitution, which sets new age limits of 30-65 years for the presidency and vice presidency, and the impeachment of vice president Dr Mohamed Jameel Ahmed. The age limits allowed President Yameen to replace Jameel with influential tourism minister Adeeb. Some 70 MPs of the 85-member house approved Adeeb’s nomination yesterday. The backing of some 19 opposition MPs yesterday was crucial to pass the second constitutional amendment on foreign freeholds. The MDP had issued a free whip for the vote. The fourth meeting of talks between the MDP and the government was scheduled for Tuesday. But it did not take place due to the extraordinary parliament session on foreign freeholds. It is very apparent that the possibility of a release will remain on the balance until the case PG is going to fight at High Court is heard and decided! Nasheed did nothing to be pardoned for. He should be cleared of all charges and released unconditionally. Later on those who had him locked up for false charges and everyone part of this plot needs to be charged and judged fairly.